Complex construction projects are requiring more and more tools. Specialized tools needed to meet increasingly specialized construction requirements are increasing tool costs at all types of contractors. These expensive tools are often being shared across crews and jobs. Sharing these rarely used tools is critical to achieving a return on the investment made in sophisticated tools. Unfortunately, this sharing also increases the risk of the tools being lost, damaged or procured for personal use. There is a direct cost to tools being lost or stolen. However, the larger cost is the hidden cost incurred by operational disruption from not having the needed tools. Jobs being slowed down because a tool is not available when needed. Key direct labor personnel wasting time calling around looking for a tool or worse, driving around picking up tools is a silent killer of productivity. Both the direct and indirect cost to operations should be considered when deciding if a tool tracking system is needed. Modern tool tracking systems can have significant impact on operational efficiency. This article discusses these issues in detail. 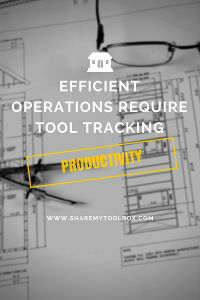 Please follow the link below to learn more about efficient construction operations through tool tracking.